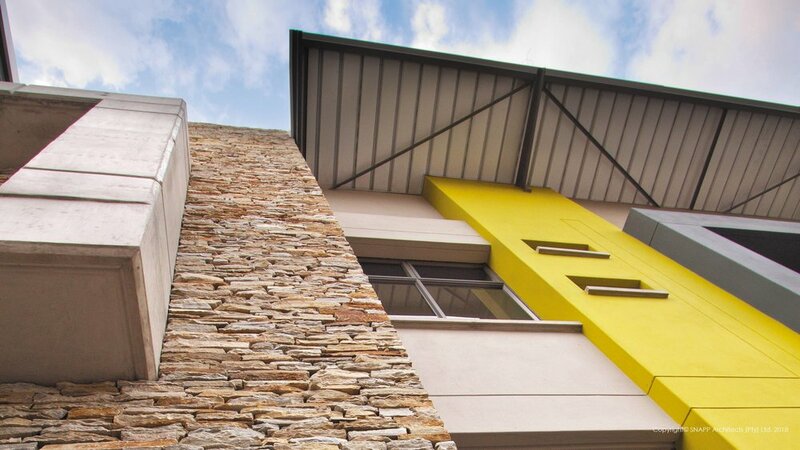 The Architect’s brief to design an office building on a prominent corner in the Menlo Park suburb of Pretoria was met with enthusiasm. The site is within easy reach of the CBD, closely situated to the N1 and around the corner from the recently revamped 13th Street with shops, cafés and even a theatre. The site, surrounded by streets on three sides, encourages a design that maximises on visual impact and interest from all possible approaches, with the main approach from its North Eastern corner. The architectural layout of the design is derived from the triangular shape of the site. The natural fall is used to enable entry into a basement that provides sufficient parking and frees the site for the building and landscape. The offices are divided into two wings linked by a central foyer and circulation area on the North Eastern corner. The stairs, flanked by large glazed windows, provide the exterior with a view inside, linking the public with the private. The practical design of the foyer, circulation and office wings provides flexibility in the long-term use of the building. 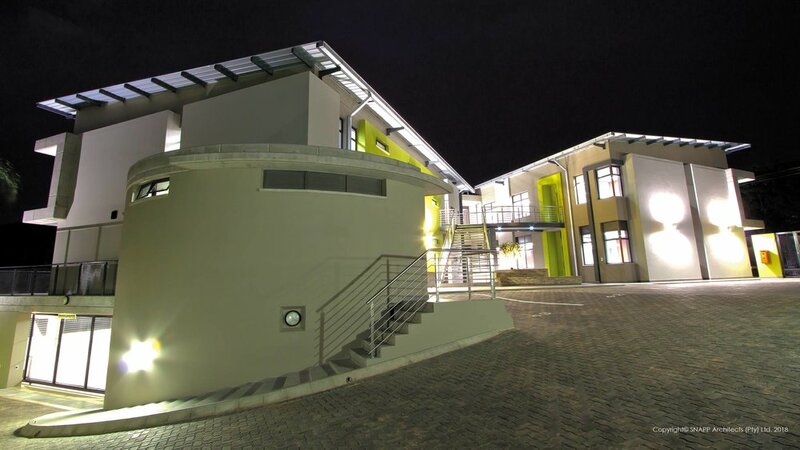 It is currently used by a single tenant, but can be divided into up to four separate office areas. Street facing balconies offer ample opportunities for employees to get fresh air and appreciate the magnificent view that reaches as far as and beyond the Union Buildings. The two wings create a courtyard on the South Western side of the building used for the main entrance and an impressive purpose designed steel bridge and stairs. The Architect makes use of a variety of materials, textures and planes in order to move away from the monotony of everyday office design. The series of concrete and coloured frames emphasize the human scale and different elements of the building. Natural ventilation and daylighting is encouraged with ample opening window sections and mostly open plan office layout. The building is such that even after years of use, its occupants will still discover new aspects and characteristics on a daily basis.